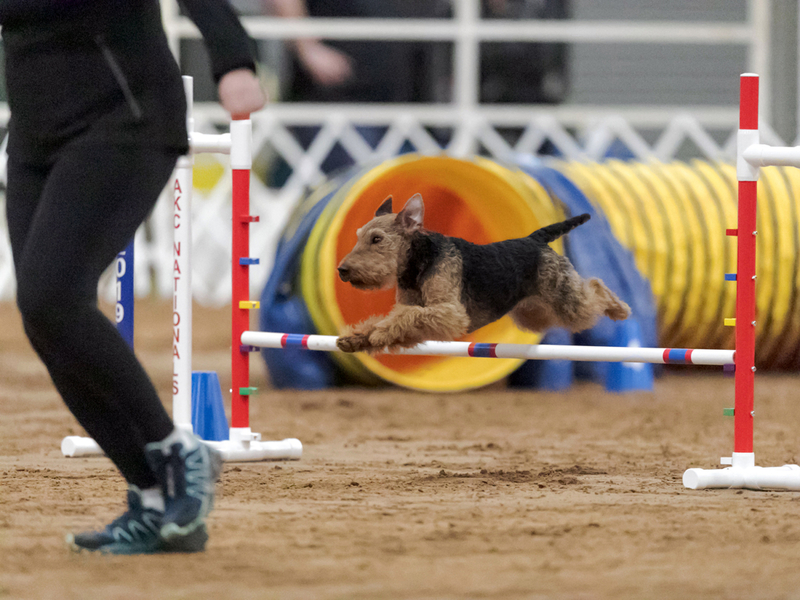 Last year, Miles and I began to compete in AKC agility more regularly. We had only dabbled before. At the end of the year, I was excited to learn that we had qualified for AKC Agility Nationals! This is a big event that draws close to 1,000 competitors. This year Nationals were held in Tulsa, Oklahoma. Miles and I are American and currently living in Vancouver BC. I entered Nationals, and then began figuring out some pretty hearty logistics for getting there! The main compromise I had to make was that we had to fly in the day before the competition, which isn’t ideal at all, especially for the dog teammate. We did this at last year’s AAC Agility Nationals, and while we’ve both worked through the jet lag and travel exhaustion twice now, I will make downtime prior to big events a obligatory factor in the future. Thursday night, Miles and I arrived to a windstorm in Tulsa. Our hotel echoed with howling from wind and dogs! My dad flew in from the East Coast to meet us, which was really special. Friday morning, I left Miles and my dad to sleep in, and walked over to the sprawling venue. I did my best to read up on how the event runs beforehand, but was left confused. It turned out that figuring it out there was still confusing! The volume of competitors alone makes NAC a very busy place (here’s a video from a competitor’s perspective). After I’d done my best to get the lay of the land, I brought my dad breakfast and walked Miles. Then we all headed over for our warm up run! My goal for it was to make Miles feel confident and happy. 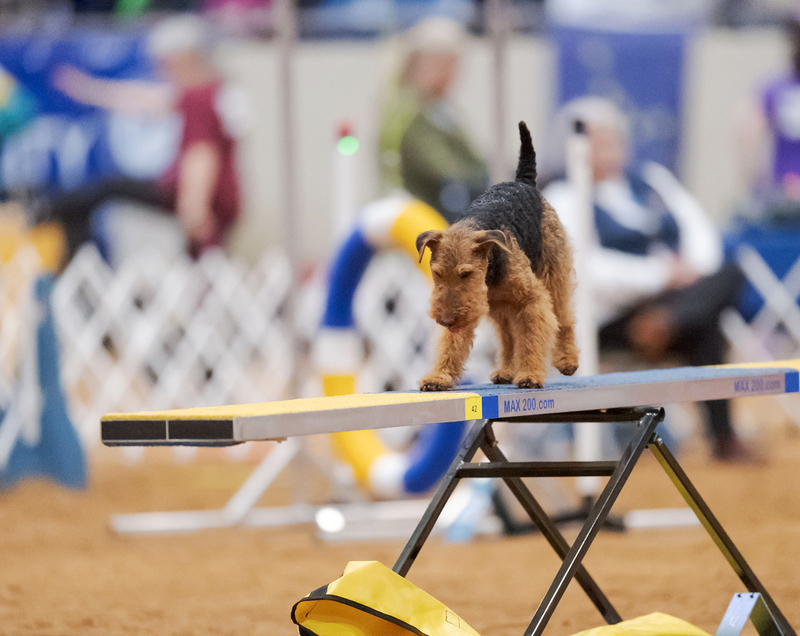 In AKC, there are only 3 main Nationals events, which is very few: two on Saturday and one Sunday morning. The top dogs from those events go on to two rounds Sunday afternoon. 2/3 of the main Nationals runs are on Saturday. Saturday could have been one of the most high-stress events of our agility career, but I’ve worked diligently for years on how I anticipate and handle big competitions for Miles and myself. It has never been easy, but my dedication and practice has gradually sunk in over time. Entering into Saturday, I felt cool, calm, and collected. 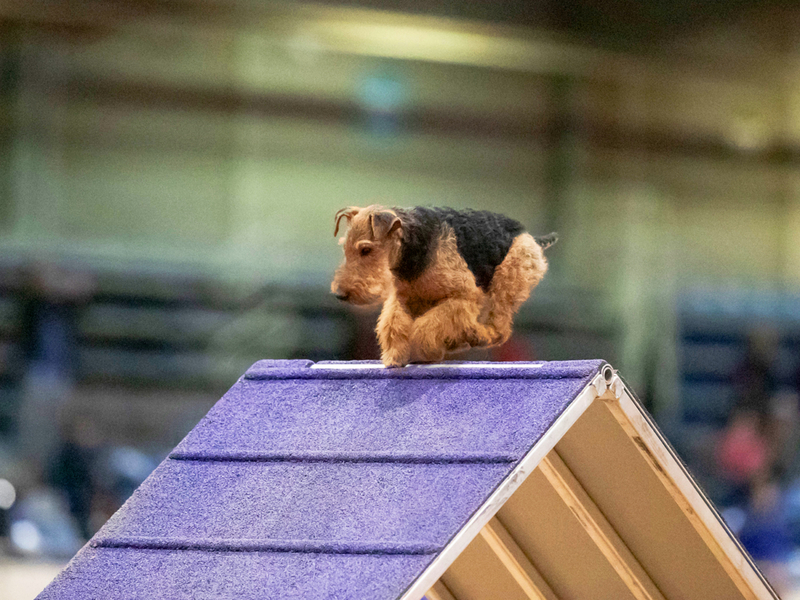 Miles was the only Welsh Terrier to compete at the 2019 AKC Agility Nationals. The Jumpers began with a tight portion that required several lead changes. A “lead change” is where you switch which side of you the dog is running on. Like most competitors, I began with two Front Crosses (where the handler gets ahead and switches sides in front of the dog). Miles was running a bit slow, but I figured that the stress of the travel and environment were a lot. I was happy with how focused and determined he was! Then came the awkward part of the course: the section with the Triple jump. I knew the most obvious option was what most were doing: a Rear Cross after the Triple jump. A Rear Cross is where you have the dog go ahead of you, and then switch leads behind them. Miles loves Rear Crosses, but I don’t like to do them near the Triple jump. When you do a Rear Cross near a jump that requires great effort, if the dog is attentive, they won’t likely have a great visual on you and will crane their neck while jumping. I also didn’t like the way a Rear Cross seemed to slow dogs down just before the next part, which was a fast stretch. I wanted to do a Front Cross (where you get ahead switch leads in front of the dog). Even though this was a better option for us, I knew it would be a more precarious choice. Miles can be a wildcard at big events if I do not stay totally connected with him, and I knew the moments leading up to this one, I couldn’t fully rush ahead of him — but to do a Front Cross optimally, rushing ahead was ideal. I watched the livestream from the hotel and only saw a few attempt the Front Cross, all much too late and with problems. I debated it for a while in front of my dad. My dad has always been our biggest cheerleader, and he understands our team better than anyone. He surprised me with serious advice: “Decide on your move, even if it won’t be perfect, and commit to it. Don’t change your mind on-course.” For many years, Miles was so unpredictable that I had to improvise constantly. Running him was like the game “hot potato!” I think I remember agility courses so well now because of that. It was a defining moment to be told to choose my agility plan and stick to it no matter what. 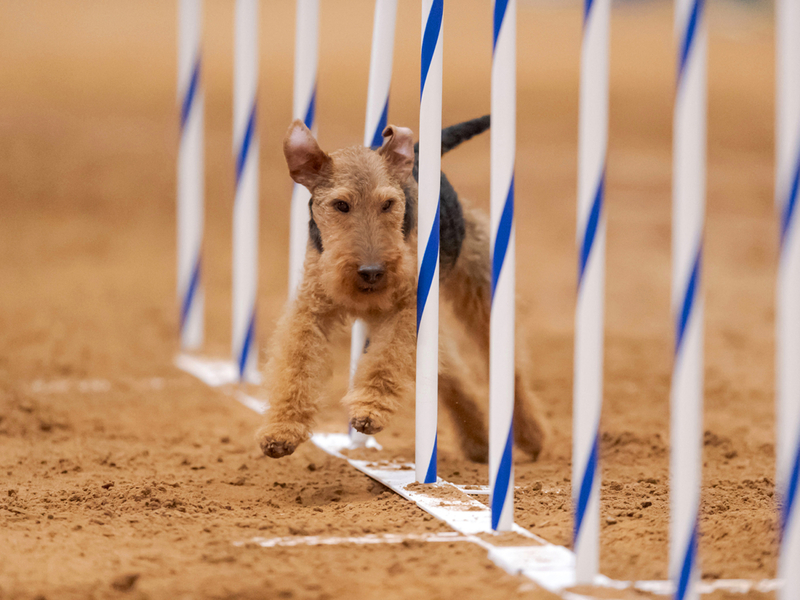 I never used to be able to do that handling a Welsh Terrier in agility. All I used to be able to expect from Miles was total unpredictability! To have my dad say “Be predictable because Miles has your back,” that was a truly amazing moment. I took my dad’s advice and decided on the Front Cross. I walked onto the course thinking, “Do not chicken out!” We got to the juncture, and I barely got there in time, but I was determined. Because I have worked SO hard on developing a relationship of respect and trust with Miles, Miles had my back. In that moment, our past struggles flashed before my eyes in an instant. I felt a swell of emotions, and our deep connection as teammates never felt so evident. The next challenge was a massive tunnel trap. Sadly (or not sadly at all, as the camera didn’t NEED to pan that way because of Miles’ path!) tunnel is not visible in the video, but it is near the end. 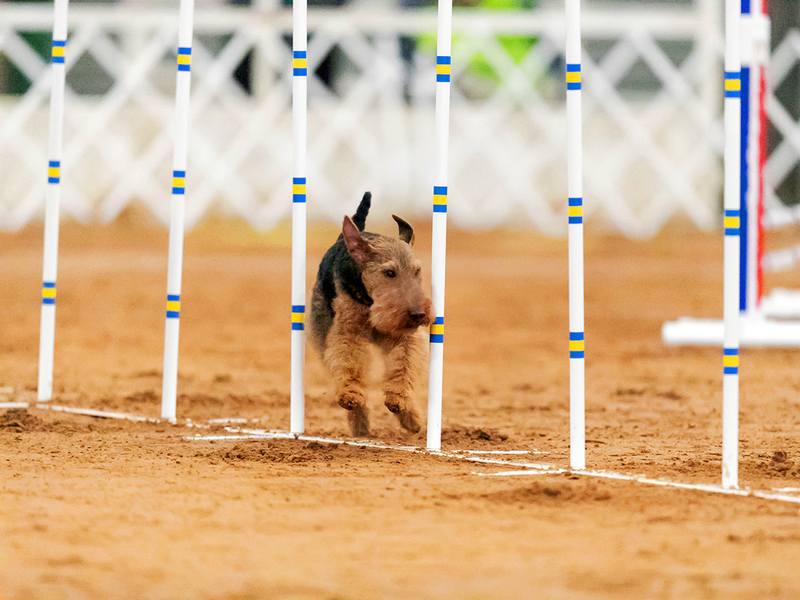 For most of our agility career, longtime readers know that tunnel traps haunted us for years. Well, I mean they haunted me! How times have changed! We’ve worked so hard together and it shows! Especially near the end of a course, tunnel traps are oh-so-tempting for the dogs. In the video, you can see me trust Miles with all of my being and do a Rear Cross while saying, “Arrrrrrrooooooounnnd Miles!” Paired with my body language I was saying, “Do this jump, then turn left!” He was focused and game, and barked with gusto as he charged into the weaves. What a little dude!!! Even though I thought the Jumpers was tough, it seemed that more of Miles-sized dogs had trouble with the Standard. Again there were some tricky lead change areas, and the Weave entry was getting a lot of teams. A lot of people were doing a Front Cross before the Weaves. I opted to do a Rear Cross, because it put less pressure on Miles heading into the Weaves. I trusted Miles and it paid off. In this course our Gamble (distance) skills came in handy a lot. It was so cool halfway through the course to have the announcer read a little bio about us over the main speaker. Also, as Miles headed towards the Triple jump near the end, I heard someone scream loudly (and you can kinda hear this on the video) “GO WELSH TERRIER!!!! !” Thank you whoever you are! We made the Cumulative top dogs scoreboard Saturday! As we left the ring, I was concerned about how long Miles had paused on the teeter, and that he was panting when he did it (see here). As we did our cool-down routine, he did a strange behavior that worried me: whenever I gave him a treat while moving on his left side, he recoiled. I showed the on-site veterinarian and she said that he might’ve had an exercise-induced stroke. I called Miles’ vet office too. Both told me that there was nothing to be done short-term, and said I should proceed as if everything was normal and wait until we got home to worry. *Piles of tests, bloodwork, and two professional visits later, it turns out that Miles hurt his left shoulder at the event. That explains why he waited for the teeter to hit the ground — he wanted to avoid the way it ricochets as it hits the ground. Poor little guy! He is currently on bed rest. After completing 2/3 NAC runs clean and landing in the Top Cumulative for our group on Saturday, I went into Sunday feeling great. The pressure was off, as our last run was Hybrid! Hybrid is like Steeplechase, which is the run we consistently land in the top of at big events. In the middle our Hybrid run, there was a timing malfunction. The judge told us to stop, and left us on-course. Miles and I waited in the ring. I tried playing with him, but he knew something was wrong. Later, the officials told me that the team should be excused so that the dog can be rewarded and re-grouped while they work on the problem. Instead, Miles and I waited in the ring and then were told to run right away. Miles was anxious and popped a weave pole. That small error bumped us out of position. 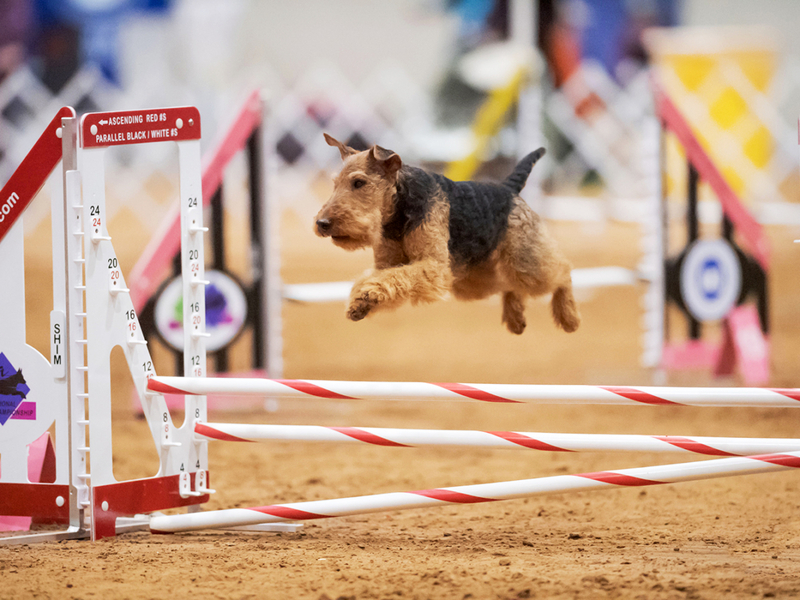 Running a Welsh Terrier, I have vast experience accepting self-imposed disappointments– but to work our way to this level, to run with merit, and then have something completely outside of us happen this way felt painfully raw. I am sure it would feel that way for anyone. I wish it hadn’t happened, but at the end of the day, the feeling I get from how we work together as a team and the way we respect and enjoy each other, that is what matters most. Miles got lots of steak at AKC Agility Nationals. When the events were over, he even got a bit of Oklahoma BBQ! Okay not a bit… Quite a bit! Milesy performed so well under pressure, facing obstacles both expected and unexpected. This little guy traveled from far away and competed with no downtime, performed at the most high-competitor-volume agility event in the world, focused through the challenges, ran with an injury that I didn’t know about, and he got through a very unusually stressful situation. This is Emma Kesler and her Welsh Terrier, Miles. 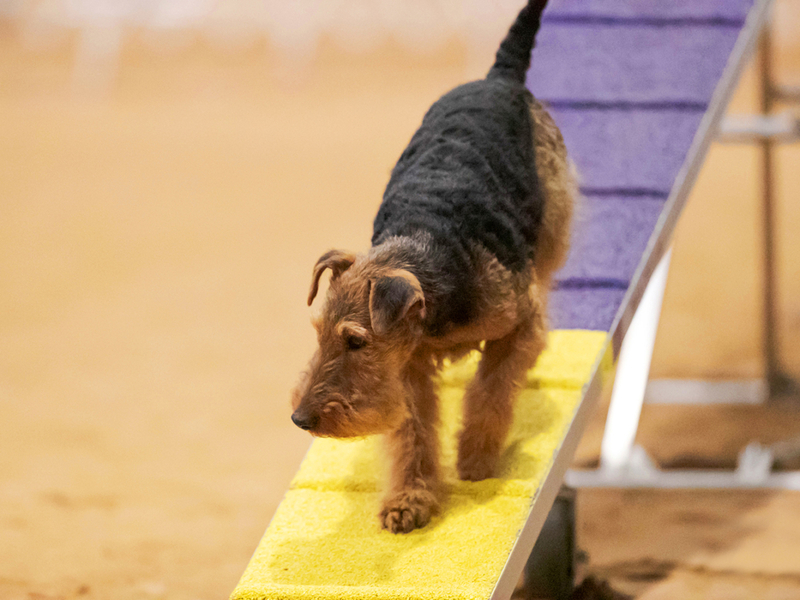 When Emma started agility with a young Welsh Terrier, she was told he was too wild for agility. Emma believes that the key to her success with Miles has been that she has never tried to dampen his spirit. Emma and Miles you guys are making me cry here in Fargo! You did wonderful. That is so cool of you two to have that huge accomplishment!!! Mungo and I are cheering you on from Fargo, dontcha know! Ha! so many hugs through the screen, it’s that hugging and jumping up and down one for you! Ha! Thank you Laurie! There were many moments I had your voice in my head that weekend — so your support was 100% in full effect. I am grateful for you! You are both amazing! Em, you are such a good story teller.. my heart was in my throat anticipating your runs, and not knowing how it would all play out! I loved watching the videos! So so SO incredible the close relationship you and Miles have… I can see him listening to you, watching you… it’s just absolutely inspirational. Truly brave and large of you to be so philosophical about the timing clock interruption! What a bother! And no fault of yours or Miles! 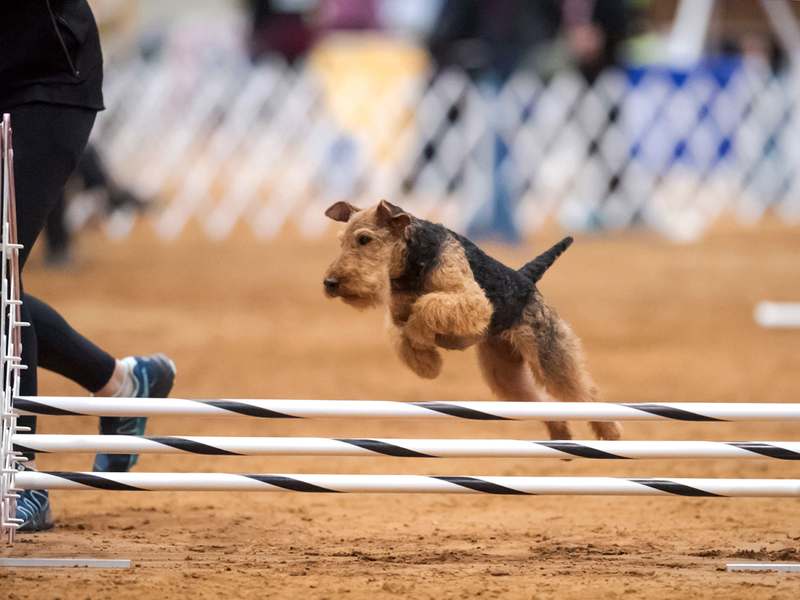 I’m very very proud of your ability to take the high road and just be happy with your fantastic accomplishment… just being there and doing so well… every time I read one of your stories I am galvanized into doing more with my Welsh Terrier. You and Miles are my ultimate inspiration! Carry on, my heroes! Carry on! Darcy, you are so kind! I am really glad you liked the post! I really haven’t experienced that particular kind of let down that often, because I prepare so, so, so much and am so attentive to what is going on. I think I am in the upper level percentile for those things because I run a very sensitive easily distracted breed. This just proved that sometimes things are really outside our control… The experience was actually much worse but I will tell you when we talk next! And HUGE congratulations on Sally’s Trick accomplishments! Love ya too! An incredible performance by both of you. You should be very proud of what you have accomplished for this beautiful breed. I looove watching Miles run, and jump and weave! You too, Emma. Ha! And for those of us fortunate to have seen all of it in person, I can “hear” all of Miles’ expressions of effort and joy and success! And although some won’t see any connection at all, it’s just like listening to Glen Gould’s humming when he plays the piano. You will have to show me what you mean when I see you next! Thank you for the endless support. Who would’ve known what this little ball of muscle and teeth would become. What a great post Emma – I was truly I mmersed in your experience! 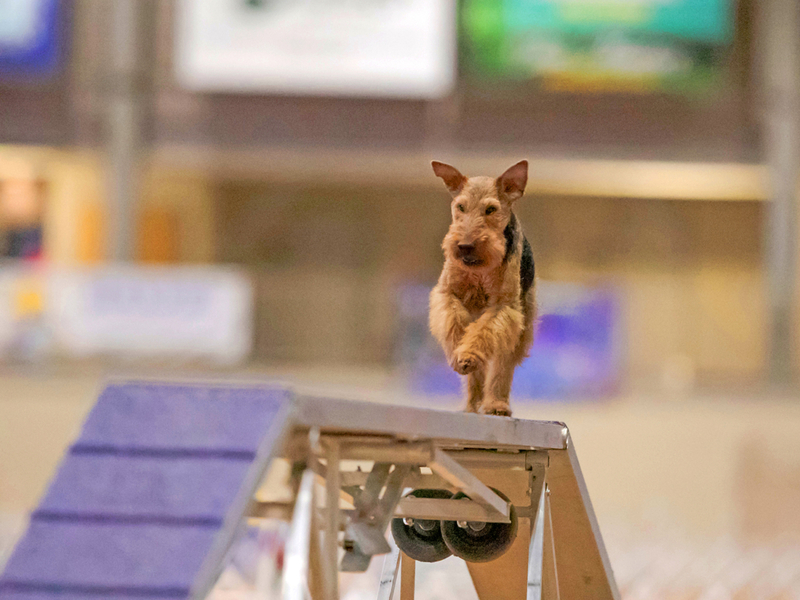 What an amazing performance, and a truly amazing agility dog – Go Miles! Thank you Kim!!! I am so excited you are enjoying the post, thank you for saying that. I will give Miles a treat from you. He has found resting really boring, but he is getting extra things to chew and games to play so he’s hanging in there, haha! Congratulations to you both! You are a fantastic team! Thank you Molly!!! PS Miles thinks you are very cute… He’s confident enough to admire taller women! What a lovely recap of your Nationals experience! When you were there, I kinda felt like I was on the journey with you, and even more so now after reading your story and seeing the videos and pictures. I truly enjoy spending time with you and Miles and “doing AKC” together; I only wish we had had more time together before Ziba retired. Miles is doing a great job carrying the torch for the Pacific Northwest agility Welsh Terriers! I’m looking forward to seeing you and Miles continue to excel at this sport that you two love so much! Cathy you were not only on this journey with me, you helped make it possible. THANK YOU for hosting us, and for the countless good times I have had over the last year. “Doing AKC” wasn’t that fun until I met you!!! 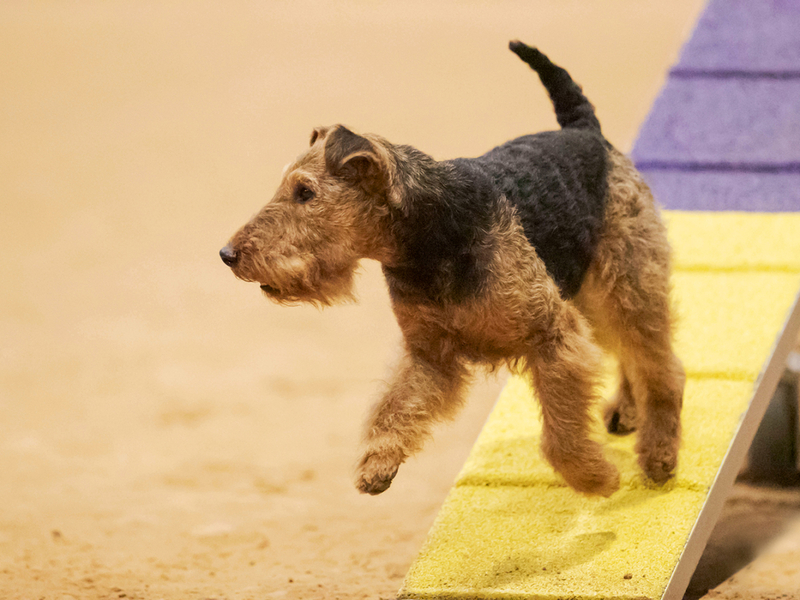 I agree about Ziba too, it would’ve been really fun to do NAC or Invitationals together as a mini Welsh Terrier army! Hopefully Miles is making Ziba proud. To more fun times, and to Axel ripening like a fine cheese, just the way Miles did! May I say after reading your blog I’m in awe. Seriously. You are an amazing woman- your passion, professionalism, determination, dedication, resilience and persistence. Suffice it to say I have the utmost respect for you! Hurrah Emma and your magical Mikes. A remarkable woman and her equally remarkable Welshie! I’m humbled and proud to have you as a teacher and new friend.